Chronic Kidney Disease in Disadvantaged Populations investigates the increased incidence and prevalence of kidney disease in vulnerable populations world-wide. The volume explores the complex interactions of genetic, biologic, cultural and socioeconomic factors such as the environment, and specific health behaviors that seem to be responsible for a significant proportion of the health disparities in these communities. 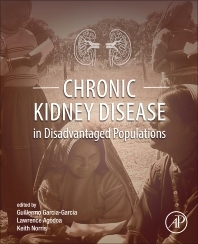 Each chapter is written by leading experts in the field and analyzes the prevalence and incidence of pre-dialysis kidney disease in disadvantaged populations across both developed and developing countries. In addition, each contribution analyzes differentiated risk factors and compares the disparities in access to screening, prevention strategies, treatment protocols and renal replacement therapies. Chronic Kidney Disease in Disadvantaged Populations is essential reading for residents, fellows, clinicians and biomedical researchers working in nephrology, internal medicine, and epidemiology, especially those working in areas with high concentrations of disadvantaged populations. Dr. Garcia-Garcia is the President of the International Federation of Kidney Foundations (IFKF) and Co-Chair of the World Kidney Day Steering Committee; he is the former Chair of the Education Committee and member of the Latin American Dialysis and Kidney Transplantation Registry, both at the Latin American Society of Nephrology and Hypertension (SLANH). He is board certified in Internal Medicine and Nephrology by the American Board of Internal Medicine, and current President of the Mexican Board of Nephrology. He is a former president of the Jalisco College of Nephrology, the Jalisco Medical Society, the National Mexican Association of Nephrologists, and Fellow of the American College of Physicians and the American Society of Nephrology. He is a former councilor of International Society of Nephrology (ISN) and current Chair of the ISN Committee on Kidney Health in Disadvantaged Populations; he’s member of the ISN CKD Task Force, the Education Committee, and the Latin American, Dialysis and Ambassadors Program. MD, FACP, FASN, Professor of Nephrology and Program Director of the Nephology Postgraduate Program, University of Guadalajara Health Sciences Center, and Chair of Nephrology at the Hospital Civil de Guadalajara, Mexico. Chair, International Society of Nephrology Committee on Kidney Health in Disadvantaged Populations. As director of the Office of Minority Health Research Coordination (OMHRC), Dr. Agodoa led the development of the Institute’s Strategic Plan on Minority Health Disparities and he is responsible for monitoring its implementation. The OMHRC addresses diseases and disorders that disproportionately impact the health of minority populations and fosters the recruitment and training of minority biomedical investigators, who are currently in short supply. He also serves as director of the Minority Health Program in the Division of Kidney, Urologic, and Hematologic Diseases. He is the co-project officer of the End-Stage Renal Disease database, part of the United States Renal Data System, which provides national statistics on kidney disease. He oversees the Minority Organ Tissue Donation Program. He has co-authored more than 253 articles in peer-reviewed journals. Dr. Norris is an internationally recognized clinician scientist and health policy leader who has been instrumental in shaping national health policy and clinical practice guidelines for kidney disease. In addition to being board certified in internal medicine and nephrology, he is an American Society of Hypertension, Specialist in Clinical Hypertension. He presently serves as a member of the National Kidney Foundation’s Kidney Early Evaluation Program (KEEP) executive committee, the American Association of Kidney Patients (AAKP) Medical Advisory Board, and the ESRD Network 3 Medical Review Board. He is also a member of the NIDDK-United States Renal Data System advisory board. He has co-authored over 275 articles in peer-reviewed journals, 25 textbook chapters, and over 240 scientific abstracts. He currently serves as the Editor-in-Chief of the international journal Ethnicity and Disease.